Hey guys! 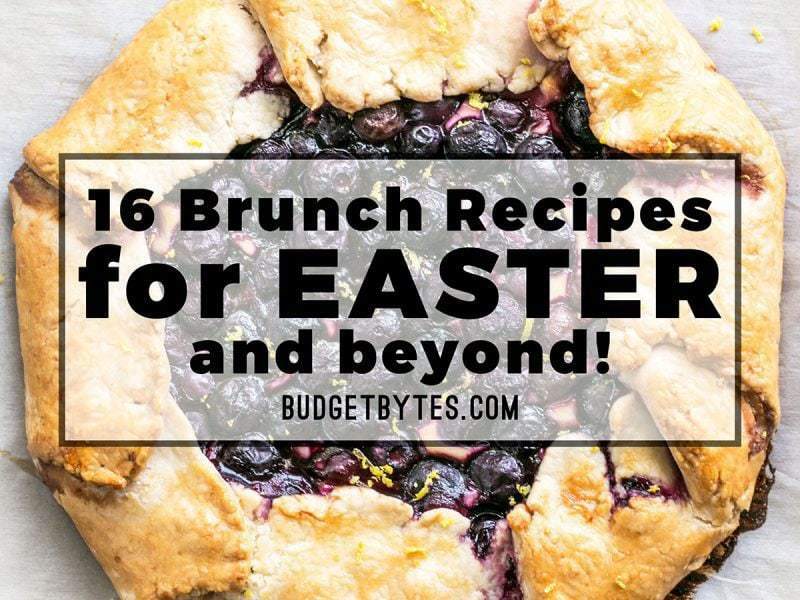 Easter is coming up this weekend and I know a lot of people cook a big Easter brunch, so I thought I’d round up some of my favorite recipes for brunch. Brunch is actually one of my favorite things. Not going out to brunch, but cooking a big brunch at home on the weekend in my pajamas. So whether you only do brunch once or twice a year for family holidays, or it’s a weekly tradition in your house, here are a few of my favorite brunch recipes for you to try. Almost Eggs Benedict – This recipe is one of my most recent creations and has instantly became my favorite. 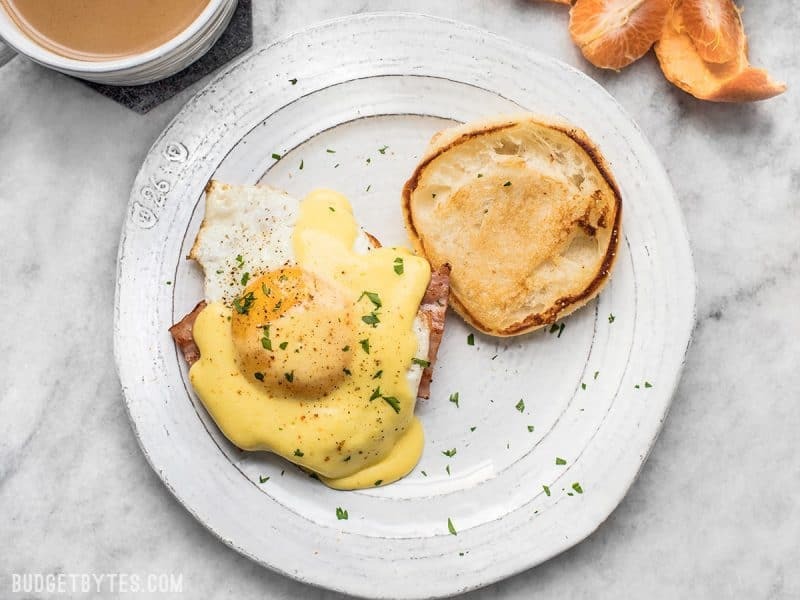 I used to only eat Eggs Benedict if we went out to a restaurant, but once I found this super simple way to make hollandaise sauce in a small batch, it finally became doable at home. This recipe is written for two, but it is incredibly easy to scale up for a crowd. 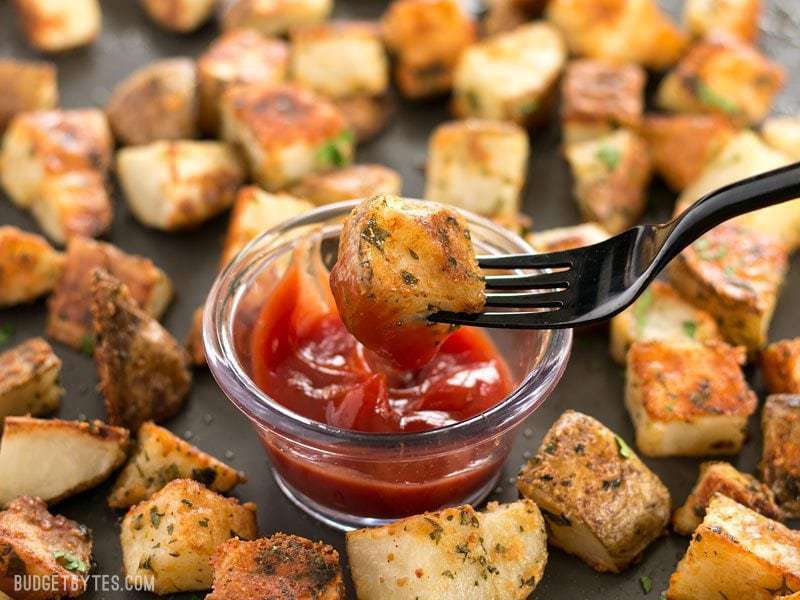 Parmesan Roasted Potatoes – Potatoes are perfect for brunch because they’re filling and they go perfectly with eggs. If you’re cooking your brunch for a crowd, these oven roasted potatoes are a bit easier to manage and low maintenance than griddle potatoes, especially when your griddle is full of frying eggs. 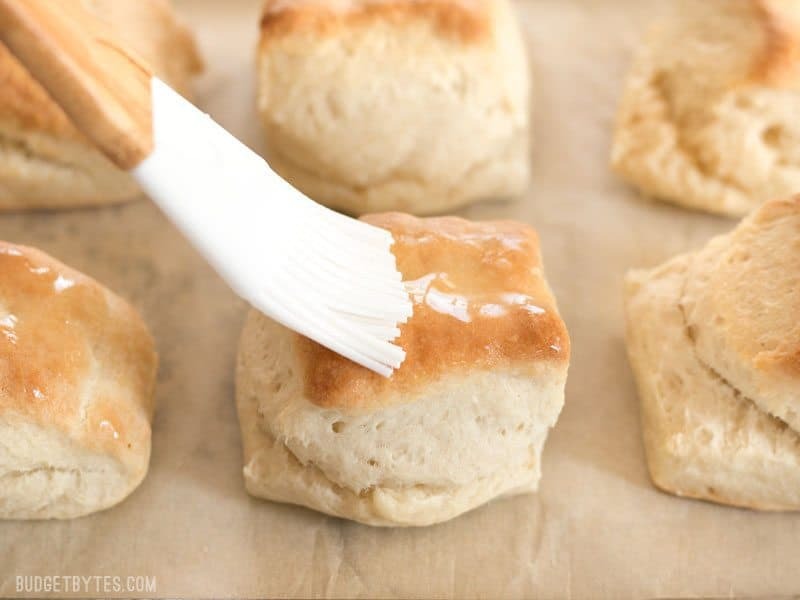 5 Ingredient Freezer Biscuits – Biscuits are a MUST for brunch and these incredibly light and tender biscuits only require FIVE ingredients! You can make them fresh, or prepare the dough ahead of time and stash them in the freezer until you’re ready to bake, which is something that comes in handy if you’re trying to entertain and cook at the same time! 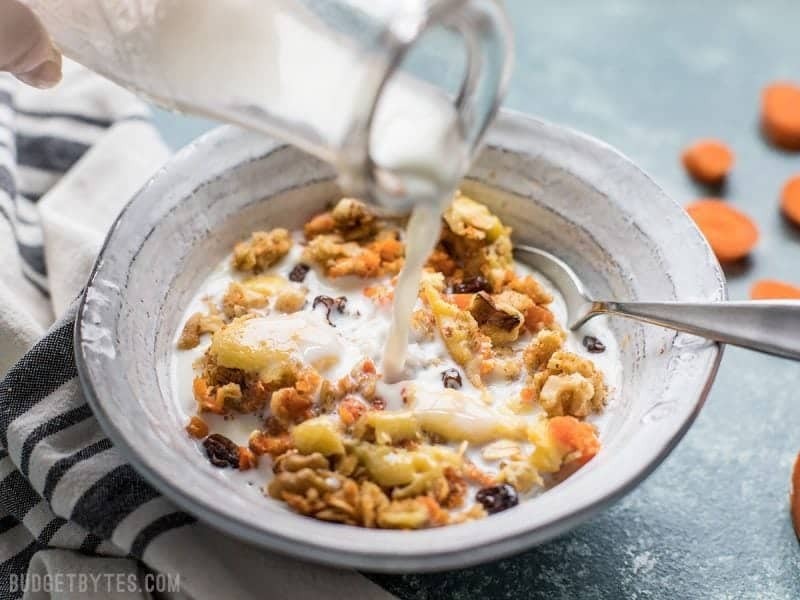 Carrot Cake Baked Oatmeal – If oats are your jam, I highly recommend whipping up a dish of Baked Oatmeal. Baked oatmeal is like oats that are baked into a slightly sweet custard, making it ultra hearty and delicious, and not at all gloppy. This Carrot Cake Baked Oatmeal is my latest flavor, which would be fun for Easter, but I have several different variations on this theme in my archives. 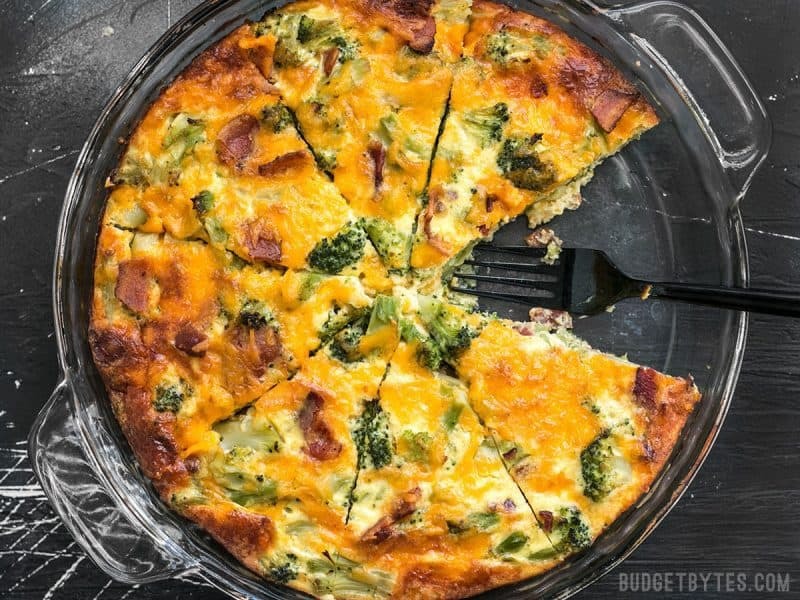 Broccoli Cheddar Bacon Crustless Quiche – Quiche is another brunch classic and it’s so much easier than you’d think! I like to do a crustless version because I feel like it gets a little too rich for my taste with a butter crust thrown in the mix, but you could certainly pour this into a par-baked pie crust as well. 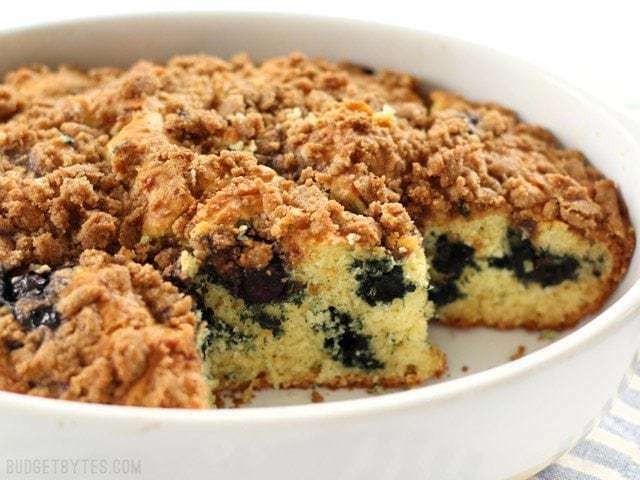 Blueberry Buttermilk Coffee Cake – This sweet treat is perfect to have on hand as your guests sip coffee while they’re waiting to sit down for the big meal, or afterward as a little post-meal dessert. PLUS, if it doesn’t all get eaten on the day of, you can wrap the slices in plastic wrap, pop them into a freezer bag, and keep them on hand for whenever you want a little sweet treat. 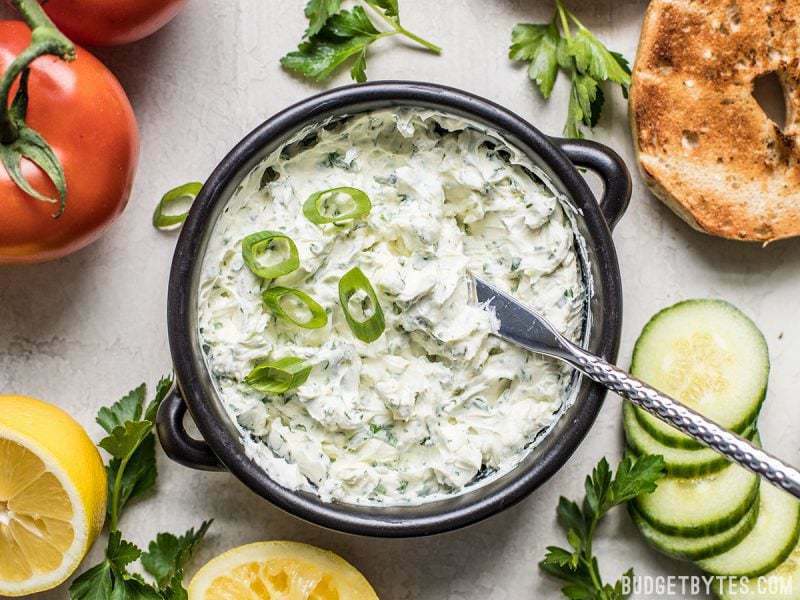 Scallion Herb Cream Cheese Spread – THIS is a must for brunch. It’s my newest addiction. It’s tangy, herby, and soooo amazing with cucumbers. If you’re serving bagels or toast, make sure to have some of these awesome cream cheese available for your guests. 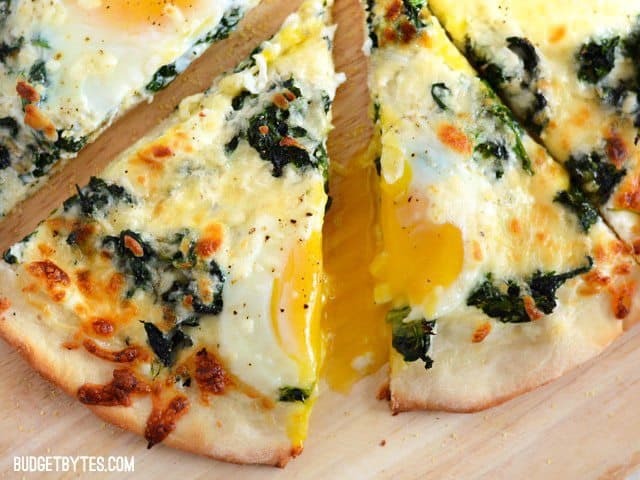 Eggs Florentine Breakfast Pizza – If you want something totally unexpected or impressive, you’ve got to try this breakfast pizza! It’s almost like an enormous open faced breakfast sandwich, but better because it’s pizza. ;) That moment when you slice through the pizza and those gorgeous yolks break, you’re sure to get some oooh’s and ahhhh’s. 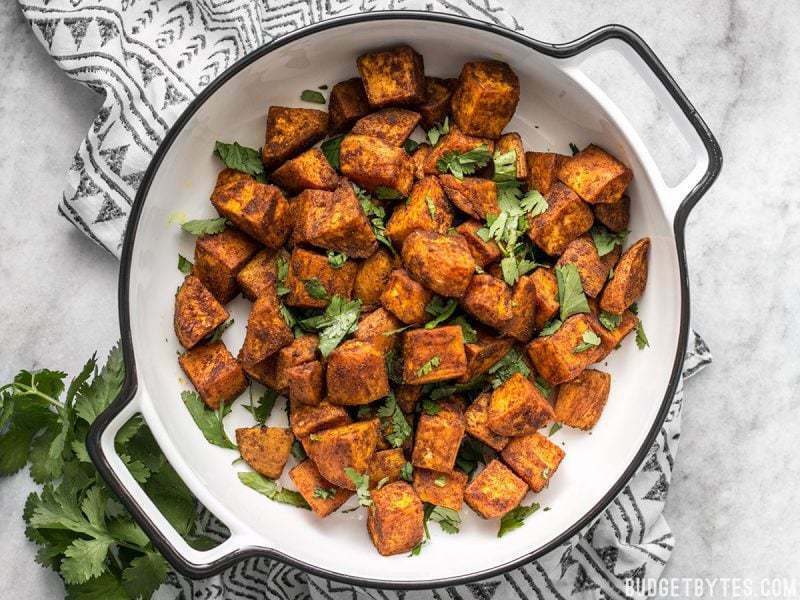 Moroccan Spiced Sweet Potatoes – Another unexpected twist on a brunch would be these Moroccan Spiced Sweet Potatoes. Try using these in place of a traditional country hash. The subtle sweetness of the sweet potatoes and warm spices pair wonderfully with eggs! 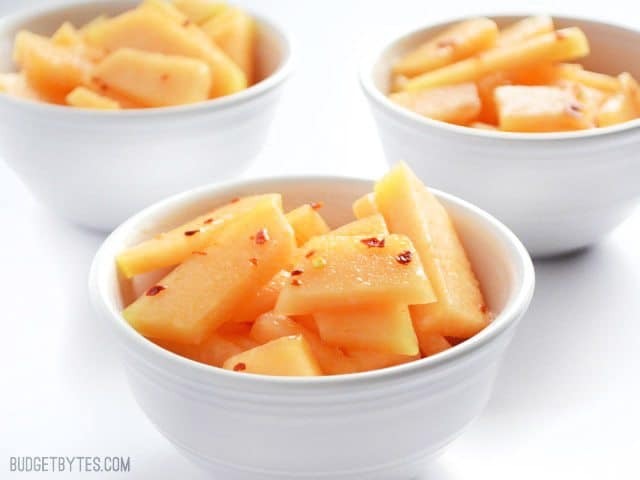 Chili Lime Cantaloupe – It’s always nice to have some fresh fruit along with your brunch, but this chili lime cantaloupe will really take things up a notch! It’s a little sweet, a little spicy, and a little tangy. It’s like fresh fruit, with attitude. 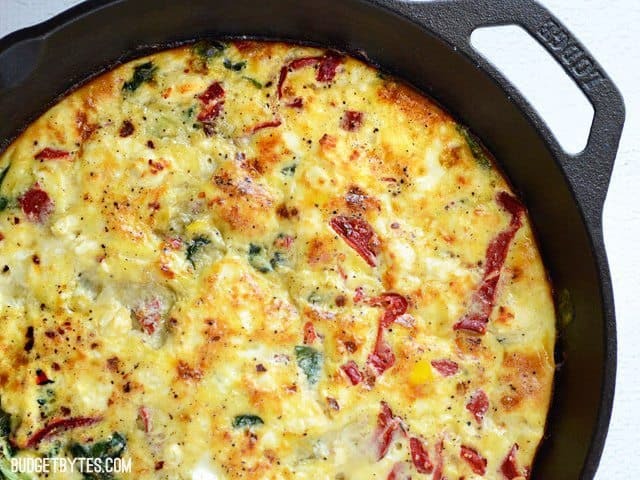 Roasted Red Pepper and Feta Frittata – Frittatas are my favorite answer to brunch because you can almost throw anything into them. So, if you’re doing a weekend brunch, take advantage of whatever you have left in the fridge and make it into a delicious frittata! This particular flavor combines roasted red peppers, feta, and spinach. 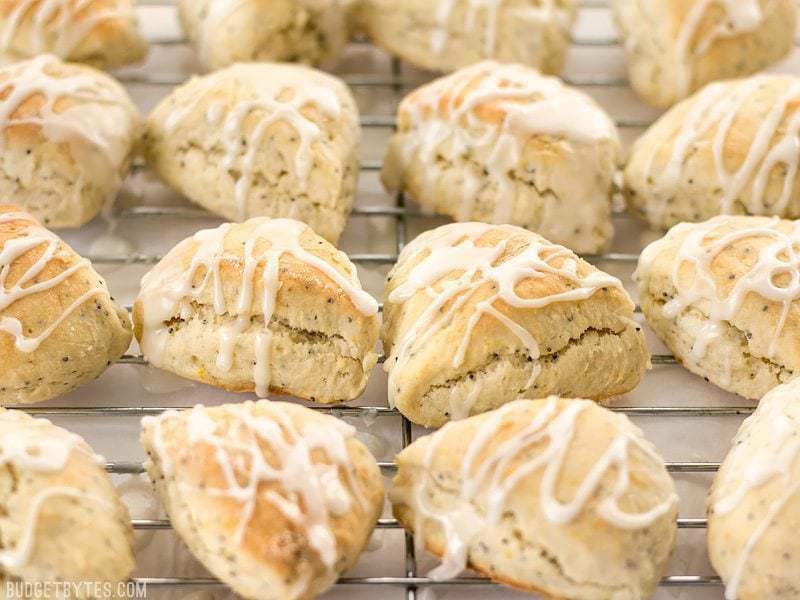 Lemon Poppy Seed Two Bite Scones – These little guys are SO DANGEROUS, so make sure you make them when you have guests coming over for brunch, so you don’t eat them all yourself! They’re little, fluffy, and so scrumptious! 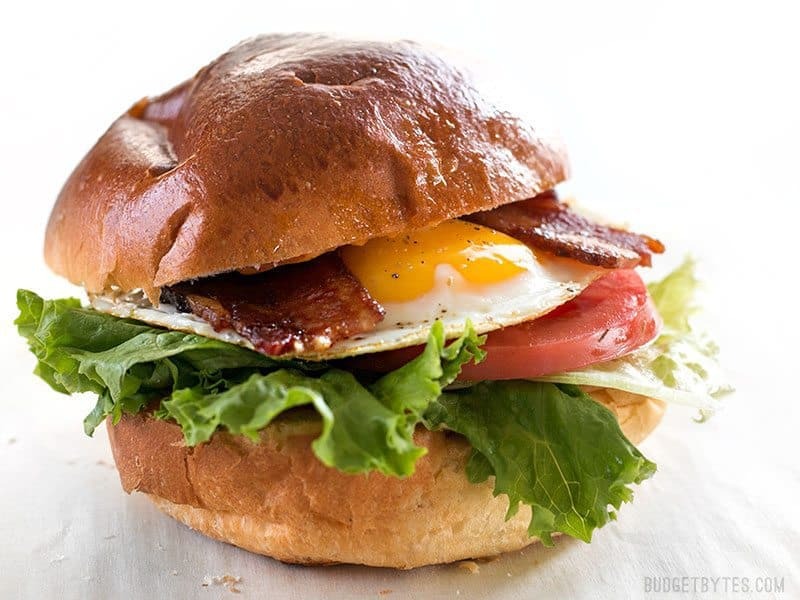 Brown Sugar Bacon Breakfast Sandwiches with Chipotle Mayo – These aren’t just any breakfast sandwich, these are special weekend brunch-approved breakfast sandwiches! The sweet and salty brown sugar bacon pairs perfectly with the smoky and spicy chipotle mayo, and it’s all stuffed inside a soft and sweet brioche bun. This is how you do brunch. 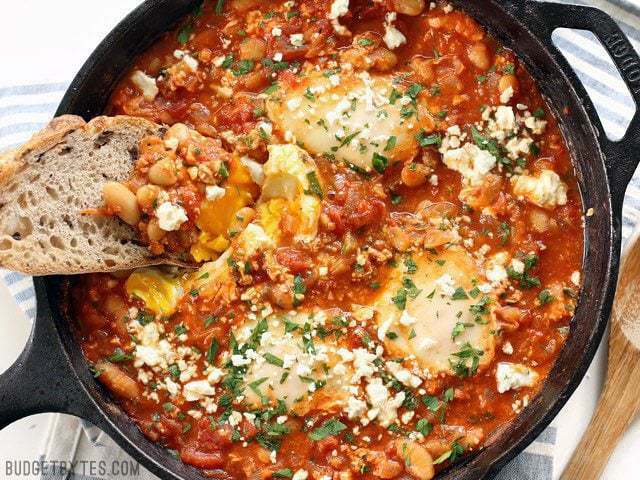 Smoky White Bean Shakshuka – This warm and cozy dish is perfect for feeding a small group. If you’re team #savorybreakfast you’re going to love this single skillet shakshuka. But make sure you get some really good quality bread to dip into that gorgeous tomato sauce! 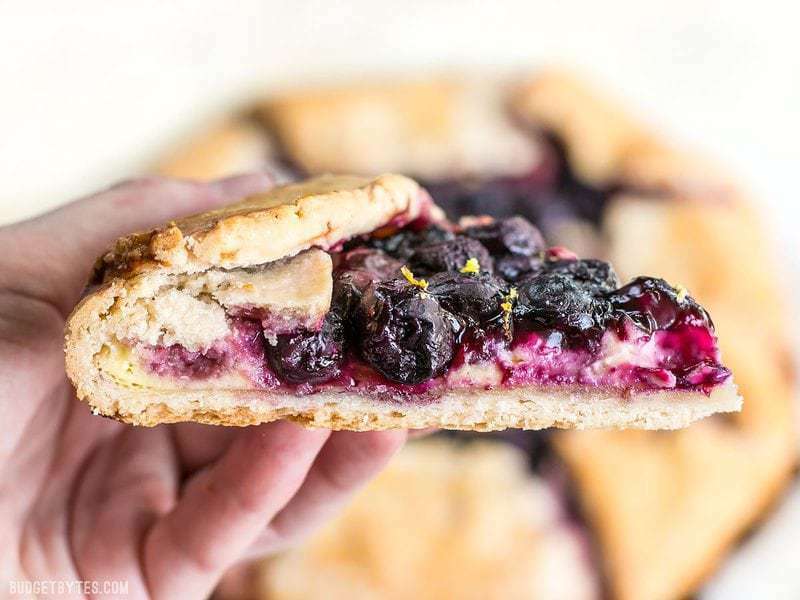 Lemon Blueberry Cream Cheese Galette – Why make a bunch of little danishes when you can make one big MONSTER danish?? Galettes are a super simple, rustic version of a pie and I filled mine with a little cream cheese, blueberries, and bright lemon. So delish! Chorizo Breakfast Hash – Does it get any more “brunch” than this?? If you’re into southwest flavors, check out this Chorizo Breakfast Hash. 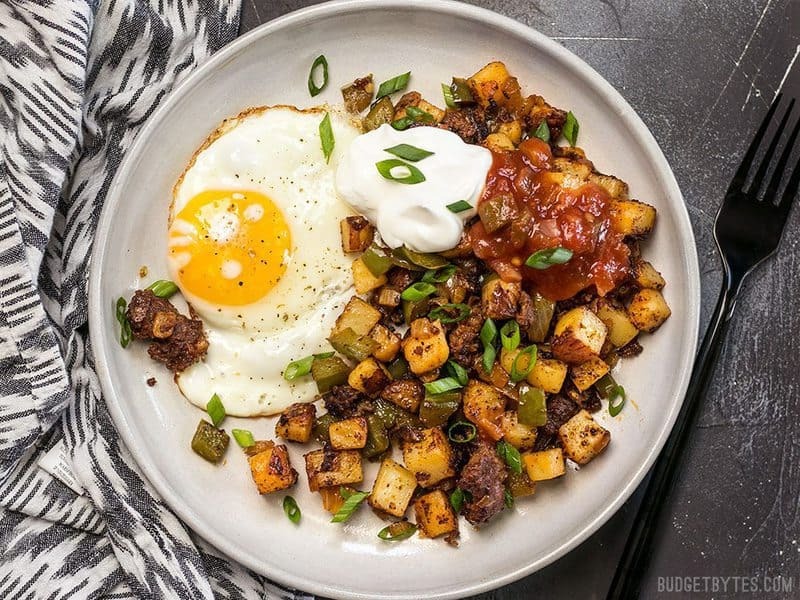 The chorizo makes this hash extra special because it’s packed with herbs and spices, which get soaked up by the potatoes, making the whole plate extra flavorful!